The New York Green Advocate: Woodstock Film Festival Premier of "Cape Spin: An American Power Struggle"
Woodstock Film Festival Premier of "Cape Spin: An American Power Struggle"
Film poster for new must see film. 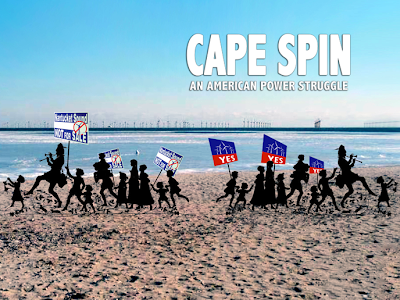 A thought provoking, almost surreal new feature documentary film called Cape Spin: An American Power Struggle cleverly captures the monumental ten year battle over Cape Wind, America's first proposed off shore wind farm planned for a 25 square mile area in the cherished blue waters of Nantucket Sound in Massachusetts. This epic, often bizarre battle over the Cape Wind project is a red white and blue microcosm of America's struggle toward a green energy future. 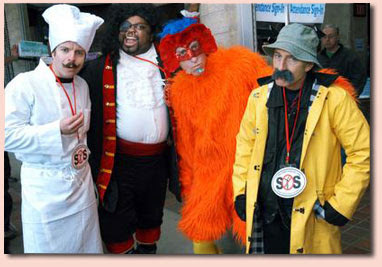 Cape Spin has a great soundtrack containing rock, pop, cabaret and Broadway style music. 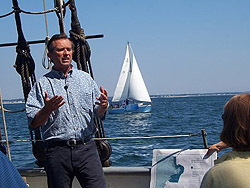 The film has engaging editing and colorfully depicts the rich, transcendent natural beauty of Cape Cod, Martha's Vineyard and Nantucket Sound, all the while showing the down to earth, comical, even ugly side of human nature, as the people depicted in the documentary take sides on a dramatic battle raging within their own "idyllic" community. 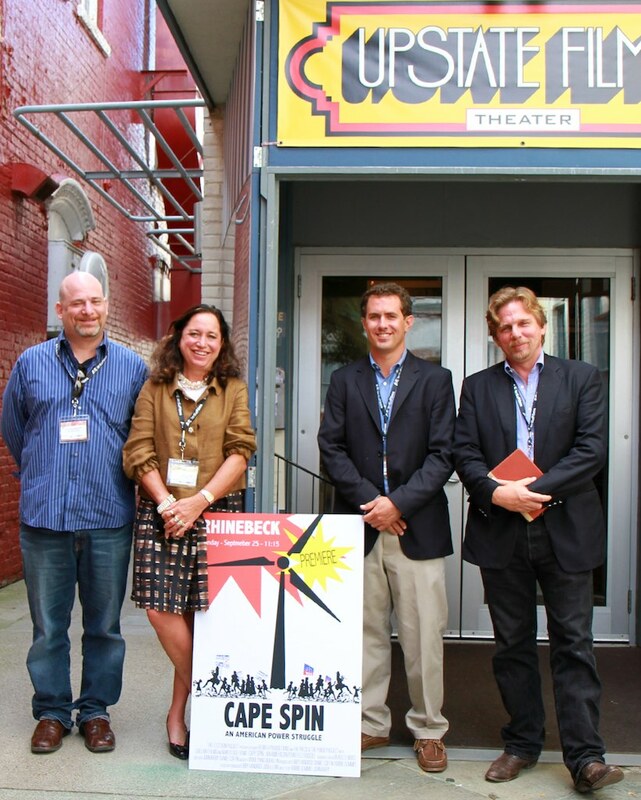 Cape Spin has a real ying yang pull, taking the audience from one side of the controversy to the other, showing how complex and layered the developing green energy revolution is, with unlikely alliances forming for and against the proposal to build one hundred and thirty, 440-foot wind turbines five plus miles off the coast of Massachusetts. 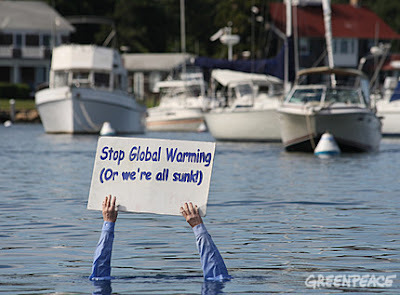 Pic Robert Kennedy Jr. on Nantucket Sound as he holds a demonstration against the wind farm. Following Kennedy's boat is a Greenpeace led boat demonstrating for the wind project and against Kennedy. 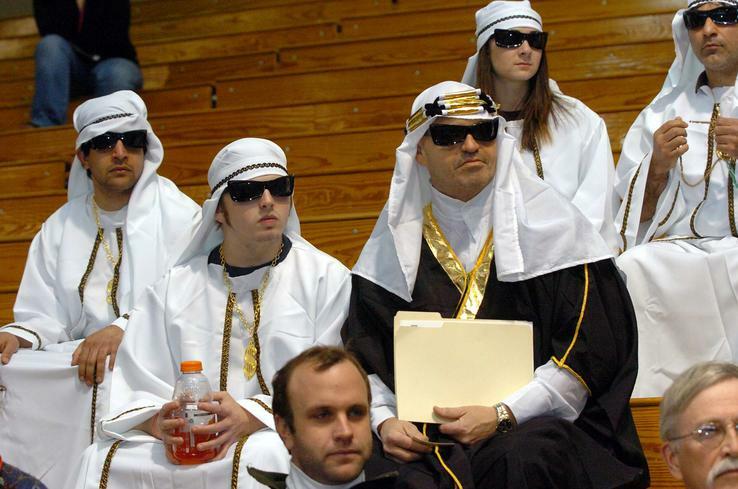 Pic Courtesy Cape Cod Times. An article in Cape Cod Times called Strange Boatfellows Clash in Nantucket Sound gives one an idea of what strange bedfellows this battle has made. Indeed, some of the eye opening revelations and ironies captured in the film is that Jim Gordon, the seemingly good intentioned developer behind Cape Wind, made a fortune in not so green and friendly gas fired power plants, some of which he still owns. Meanwhile, legendary environmental activist Robert Kennedy Jr is strongly against the clean energy project while the notorious activist group Greenpeace has taken the side of big energy developer Jim Gordon against the Kennedy eco icon. What's wonderful about Cape Spin is that it manages to leave the viewer agreeing with and then questioning the logic and motives of both the anti wind farm camp and the pro wind camp. At times, the citizen activists in the film, both privileged and not - upper, lower and middle class - actually seem like characters trapped in a fictional drama; one gets the feeling "what a long strange trip it's been" for the subjects who jump out at you from the screen with an intensity and passion captured eloquently by the filmmakers who seem to be invisible and almost like all-seeing flies on the wall. I had the pleasure of seeing the film festival premier of Cape Spin at the Woodstock film festival and attend a lively Q & A with the film's directors and producers. After the Q & A I had the opportunity to interview one of the directors, Robbie Gemmel, the passionate young filmmaker who was the genesis of the film. Robbie was inspired to tackle the subject by a professor while an undergraduate at Emerson College in Massachusetts. Gemmel even went so far as to get a job on a fishing boat in Nantucket Sound to study the subject of Cape Wind. For him the making of the film was a battle all to its own because of all the barriers that come with creating an independent film with more passion than deep pockets. Before seeing the film I was hell bent on getting Robbie to tell me what side he took in the Cape Wind skirmish, since the previous press for the film proclaimed it was the filmmakers' objective to be objective and not take sides in the controversy. Despite the successful efforts of the filmmakers not to take a stand, I imagined, surely Robbie had formed an opinion by now. Robbie said when I spoke with him: "I can honestly convince myself either way - to be for or against the Cape Wind farm. I think both sides have a lot of valid points and there are reasons to build it and not to build it. But in the end I ultimately think the controversy is really good for the course of conversation around renewable energy development and for the awareness it's brought to where our current energy is coming from and the challenges we face to build large scale renewable energy sources." I also met the film's other director and editor of Cape Spin, John Kirby, who became part of a creative team that produced the film. By meeting and speaking with John along with Robbie, I saw how they, even amongst themselves, debated the merits and downfalls of Cape Wind and still to this day continue the debate by questioning the up-sides and down-sides of the Cape Wind project. John Kirby elaborated: "This Cape Wind controversy is happening all over the country. There are solar projects that are in contention, there are other wind projects in contention right here in New York. So if there is a lesson to take from this controversy it is - don't wait for a developer or the federal government to come in and say - this is where we are going to put this new energy facility - go ahead and build your own. It belongs to you - the wind, the sun, this belongs to you. That to me is the message to Cape Spin- power to the people." 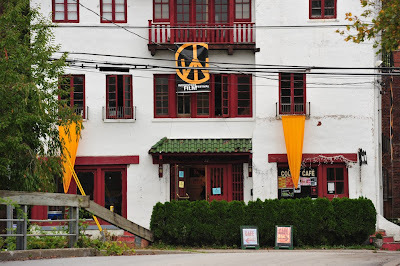 The Colony Cafe in Woodstock, New York, hub for the Woodstock Film Festival. 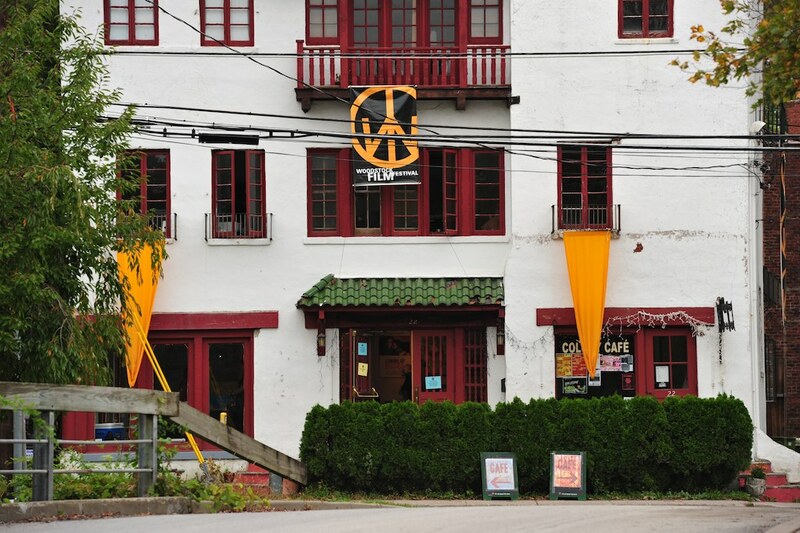 Pic Courtesy the Woodstock Film Festival. So what does this writer think about Cape Wind and whether or not it is an appropriate project in that location at this specific time? After seeing the film I was not so sure what I thought. It became clear to me that maybe in eco cinema one not need take a firm position to still get a clear pro environmental message across. As I told the one of the producers of Cape Spin, Josh Levin, when we spoke at the Colony Cafe in Woodstock, part of me is RFK Jr who has come out swinging against the project. And part of me is Greenpeace which has come out vociferously promoting the project, ironically taking the side of the project's developer Jim Gordon, who as I mentioned the film points out, made a fortune on gas fueled power plants and stands to make another fortune on the Cape Wind project if it ever gets completed. 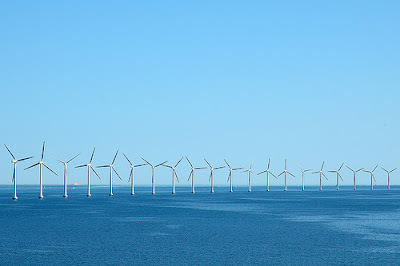 Offshore wind farms are fairly common in other parts of the world, such as Denmark, where large portions of their electricity are generated from wind and other renewables. 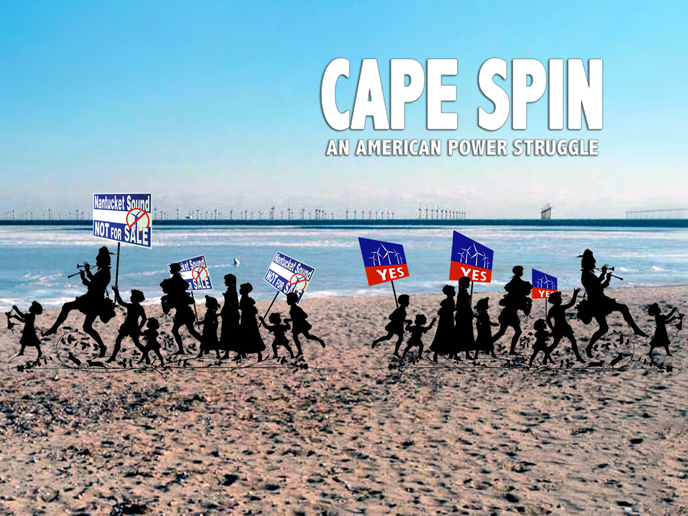 But as Cape Spin masterfully depicts, here in the USA, a whopping $70 million dollars has been spent by the opposing sides fighting for and against our country's first offshore renewable energy project. One could imagine what good $70 million dollars would do toward making the the Nantucket Sound region more "renewable" with energy efficiency and small scale renewable power than thrown out the window in a surreal fight that seems as absurd as it does endless. But like the team behind Cape Spin points out, despite the enormous amount of money spent, with no clean, renewable energy generation to show for it, the controversy has created awareness about the issues and that helps. In the end, no matter what you think about Cape Wind, and the film about it, what Cape Spin really becomes is a sly educational tool showing the do's and don'ts about how to move forward to a clean energy future. Cape Spin asks more questions than it answers, raises both red and white flags and shows all the gray within the green. To further educational goals, the producers and directors of the film are collaborating on a multimedia educational platform called the Electron Project which was inspired by the Cape Wind controversy and the decade long journey of the film and its subjects. The Electron Project will show citizens across the country, exactly what amount and type of energy they are using and where it comes from. And it will offer resources to show people regionally how to become more energy self-sufficient. As Robbie Gemmel explains: "The idea is that the Electron Project will accompany the film and as we roll out the film we are going to educate people about where their energy comes from and get them involved in it. We want to make an interactive process and connect audiences to local resources so they can live more sustainably and help develop a cleaner energy future for our country"
The Woodstock Film Festival stated appropriately "Cape Spin was “Fueled by a satiric ‘revolutionary’ soundtrack, and is a gripping and entertaining study of eco-capitalism and grassroots democracy.” One puzzled looking woman in the film says simply yet profoundly at one of the many heated, over-the-top demonstrations about the wind farm: "It's interesting to see the public process unfold at these events - this is what America is all about." Anyone who gives a damn about giving a damn should check Cape Spin out. Check out the trailer to Cape Spin below. Cape Spin Trailer from Rebirth Productions on Vimeo. Great Review and excellent movie. We're lucky to have passionate people like these filmmakers to not only stand in the middle of this heated debate, but to also so clearly depict all the factors involved. I feel much more educated about wind powers pros and cons. This isn't a story about what's happening in the Cape, this is what's happening in our world.